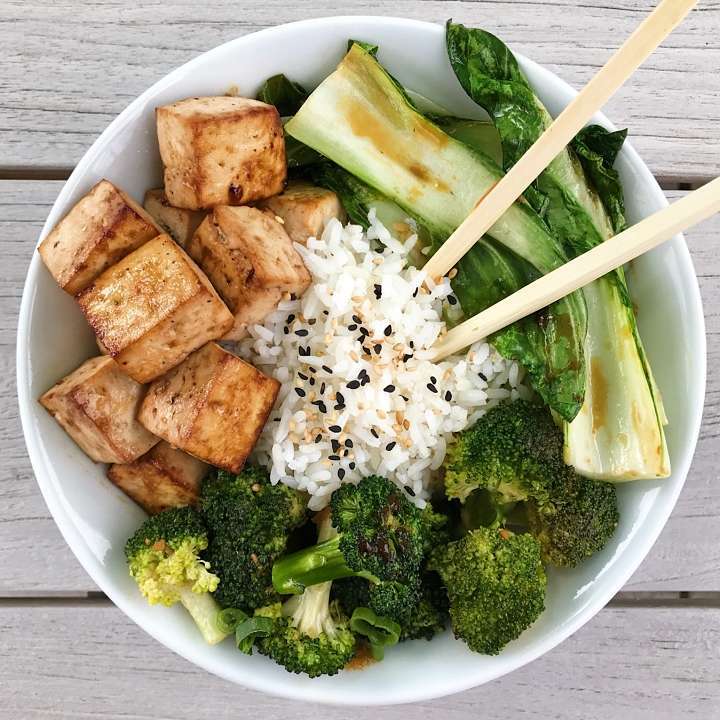 By now you know, I have a thing for Roasted Tofu… this time it’s paired with a quick and easy stir fry using the marinade as a sauce for the veggies. It couldn’t be easier or yummier! Given that my family doesn’t love tofu the way I do, I opted for the family’s favorite green vegetables for stir frying — broccoli and bok choy, and made some stir fry chicken for the rest of the crew. The recipe is adapted from Vegetarian Times Magazine. It is quick, easy and easily adaptable. We use different veggies each time and I always use the same marinade to make chicken for the boys. You can also use more or less wasabi or ginger depending on taste. No matter how we make it, it’s always a crowd pleaser. An easy weekday dinner big on flavor. Stir Fried Broccoli and Bok Choy, roasted tofu and a Wasabi Ginger Sauce. Recipe adapted from Vegetarian Times, there is room to play with how much wasabi and ginger you want. Option: stir fry some chicken for the meat lovers in your family. Meanwhile, whisk 1 tablespoon cornstarch into reserved marinade, and set aside. Option1 : add reserved marinade/ sauce directly to the vegetables and stir fry one minute until sauce thickens. Option 2: In a small saucepan, add reserved marinade/ sauce and cook up a minute or two until thickened. Serve over vegetables and rice. NOTE: To keep the veggies separate in this photo, I sautéed them each separately. First the broccoli, then set aside; then the bok choy. Add cooked chicken to cooked veggies and stir fry sauce.